Here we look at the fashionable hairstyles of Edwardian women, from the fictional beauty of the Gibson Girl to the huge pompadours worn to support the enormous hats of the decade. We also look at hair accessories and give a nod to the hats of the era, as they had such an influence on a woman’s hairstyle. The death of Queen Victoria in January 1901 and the succession of her son Edward marked the end of the Victorian era and the start of the Edwardian. King Edward VII was an affable, good mannered and diplomatic man, who reigned with Queen Alexander by his side, until his death in 1910. Paris was the dictator of the Edwardian women’s fashion in Britain and America, while London influenced men’s apparel. Women in Britain and America, being influenced by Paris, had very similar hairstyles. Music Hall was tremendously popular in Edwardian days and the operetta “The Merry Widow” by Viennese composer Franz Lahar gave rise to the style of feathered hats worn in the production to be known as “Merry Widows”. Ah, the fictional Gibson Girl. Portrayed in the satirical pen-and-ink-illustrated stories created by illustrator Charles Dana Gibson in America, the perky Gibson Girl was the epitome of the feminine ideal from the late Victorian era to the early 1910s. She was tall and slender, yet curvy, with her hair piled high on top of her head in the softly swirled pompadour style of the day. The hourglass-figured, swan-necked Gibson Girl was seen as representing the beauty ideal in America for nearly 20 years until World War I and the changing fashions resigned the Gibson Girl to history. Illustrations of the Gibson Girl by Charles Dana Gibson; Actress Billie Burke (who later played Glinda in The Wizard Of Oz) looking every inch the real life Gibson Girl. 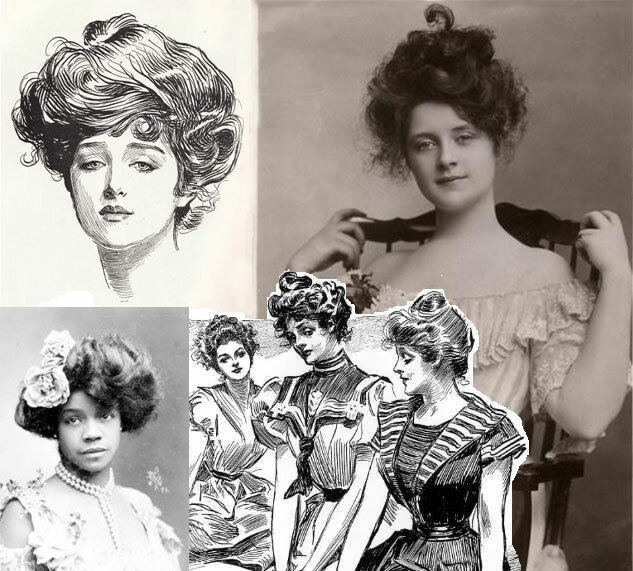 Bottom left: Young woman with a Gibson Girl hairstyle. Edwardian women wore hats outside of the home and for social occasions. 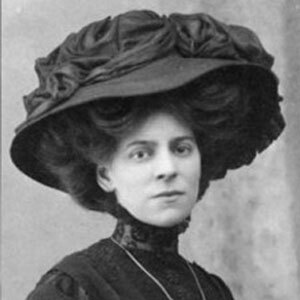 The Edwardian love of large hats affected hair fashions and how the hair was dressed, as the hairstyles had to be able to support the size and weight of the headwear. Straw hats were popular in summer; felt was used more in winter. Ribbons and feathers were popular decorations. Overall, women’s Edwardian hairstyles had a soft, fluffy and loose fluidity about them, despite being large and often padded to create the bulk and size fashionable during this era. The hair could even be quite fuzzy, especially if Marcel tongs were used regularly. Hair was dressed up and away from the face, with the exception of a curled fringe which sat on the forehead. The defining hairstyle for the Edwardian women was the pompadour. Named after the Marquise de Pompadour (Louis XV’s chief mistress in the mid-1700s), the Edwardian version is fuller than the Madame’s. The shape of a pompadour is high, rounded and curved away from the head. A pompadour could be dressed in all manner of styles – the hair could be straight or have a wave or curl to it. The hair could be simply swept up with a bun, or feature soft coils, chignons and fuzzy curled fringes. To shape and support the hair, it was often drawn over a “rat” (a matted pad or roll of hair) or a pompadour wire frame. Backcombing was also used to form a matted foundation on which to smooth the outer layer of hair over. 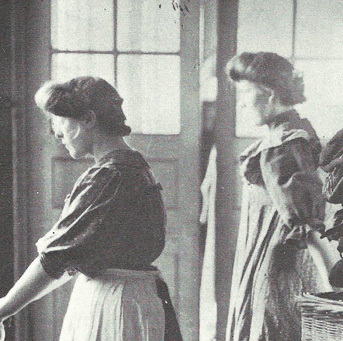 Two women working in a laundry, showing the pompadour silhouette of this Edwardian hairstyle. Silhouettes are critical for crowd work on film and TV productions. A pompadour could be decorated with a bun, chignon or knot, depending on what was in vogue at the time and the occasion. Chignons tend to sit low on the nape, or at the back of the head. A bun during this era was most likely situated on the crown, creating a “cottage loaf” look. A knot is hair that is twisted to form a rope, which is then coiled to form a shape. The different shapes had names; for example, the Apollo Knot and the Grecian Knot. A topknot sits high on the head. Teenage girls wore their long tresses down – either held at the nape of the neck in a simple bow or worn in a single plait. The end of a plait could also be tucked under and secured at the nape with a ribbon. Their “crowning glory” would be put up into the familiar pompadour once they reached 17 years of age and entered the world of adulthood. It was then considered inappropriate for hair to be left down. Lovely examples of Edwardian hairstyles (L to R): a rounded pompadour; a more elaborate pompadour style; a teenager’s “crowning glory” plaited with a ribbon bow; a late Edwardian style suitable for the large flat cartwheel hats. Curls were in and Edwardian women had curling irons that were heated in the fire. The hot irons were then applied to the hair, potentially leading to singed hair and even baldness. Heated waving irons were also used to create frizz – from soft and fuzzy edges on the fringe to curls along the nape. The heat of the tongs could be tested on newspaper beforehand, or paper could be wrapped around strands of hair to protect it from rough or overheated irons. The Marcel wave was in vogue and is most likely the inspiration for the invention of the permanent waving machine in 1906 by German hairdresser Karl Nessler. However, with perms taking at least six or so hours to complete and costing a huge wad of money, understandably not many women could take up the new found permanent wave during this decade, but for those who could it was popular. Perms involved wrapping the hair around rods and covering it with substances like alkaline paste and asbestos. Gas was used to steam the curls tight. It could really damage the hair. During testing, the inventor even burnt off his wife’s hair – twice! Edwardian hats were big – and got bigger through the decade. So much so that theatres insisted women remove their enormous hats while attending a performance, allowing the poor suckers behind to actually see the stage. Removal of these large hats was not a minor undertaking! Hats were part of everyday life, from morning to night, and the hair was styled accordingly to accommodate the hat. The seasons affected what was worn. As a general rule, straw hats were worn during summer, while heavier velvet or felt was favoured for winter. Ladies with their finger on the fashion pulse would wear their new spring hat on Easter Sunday, most likely to church. When riding in the open motor cars (and without a windscreen) of the day, ladies would use a wide chiffon veil about three to six feet in length to drape around their hat and tie under the chin. There were also silk bonnets called “automobile bonnets”, especially designed for ventures in the car (worn with goggles to keep the dust from one’s eyes). Edwardian hats: 1) Flower decorated hat; 2) A wide-brimmed straw cartwheel; 3) A large flat cap; 4) A wide hairstyle to support the width and sheer size of this tulle-swathed monster; 5) Merry Widow hat decorated with ostrich plumes. Photos from www.photodetective.co.uk. Top to bottom: 1) Evening pompadour with comb, 1901; 2) Pomp with braid and rose, 1902; 3) Tea roses and bird-of-paradise plumes, 1907; 4) Marcel waves and puffs, 1907. Braids were a popular element for both women and girls. Switches could be used to add a braid into a hairstyle. Combs were both decorative and functional, with two or three keeping the hair in place for the day. The large Mantilla combs (usually worn at the back of the head) were often highly-decorated with coloured stones, baroque pearls and gold filigree. Long, curved combs were more simple in design and used to hold the hair in place. New plastic materials were also being used to replace the traditional materials of ivory, bone, tortoiseshell and horn. Celluloid and Bakelite were cheap and easy-to-mould materials that could be produced in various colours. Postiche was used to discretely adorn or bulk out the large pompadour styles. Switches and clusters were commonly used by ladies to decorate or add details such as a chignon or braid. Wigs (or transformations as they were known then) were not uncommon, and pre-styled false curls and fringes were also available. Items were made from human hair. Flowers were tucked behind the ear or into the bun or chignon. Blooms such as small pink roses, violets and forget-me-nots were popular. Hair pins were essential to helping keep the big hairstyles secured in place and came in various sizes and materials, including shell, amber, bone and horn. Hat pins were used to keep the incredibly large hats secured to the hair – and big hats needed big hat pins, which could be as much as 14 inches long. Pins were decorated at the head, featuring designs from the simple to ornate. Silver, glass and jewels were often used. The ends were very sharp and, therefore, potentially dangerous. Women were not allowed to wear unprotected hat pins on buses, and suffragettes had to remove hat pins while attending court, in case they stabbed someone! Hat pin collections would be stored on a padded pin cushion with a series of loops to hold the pins. Feathers were very popular, and the feathers of many feathered friends became the fashionable hair and hat adornment. This particularly gained momentum in the second half of the decade, taking over from the ribbons and flowers. Ostrich, bird-of-paradise and the tufted plume of the egret (called an aigrette) were all the rage and often worn in huge and luxurious quantities. Sometimes the whole bird would be strategically placed as a dive-bombing hat decoration. The destruction of birds for fashion (along with hunting) was so vast that in 1905, the National Audubon Society was formed in the USA. 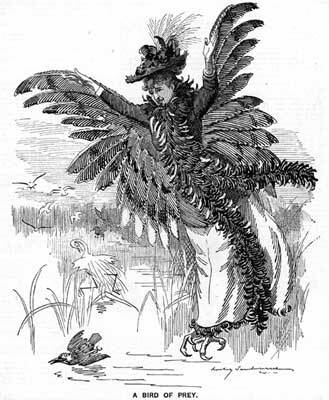 The Society established the Audubon Plumage Law, which banned the sales of plumes from native birds and the importation of aigrettes and other feathers. In the UK, the Royal Society for the Protection of Birds (first established in 1889 as the Plumage League in protest at the number of birds being killed for clothing) was granted a Royal Charter, leading to laws banning the use of certain plumage in clothing. Goose and chicken feathers became the substitute material, dyed and fashioned artistically into decorative pieces. Wire frames in a variety of shapes and sizes were used to help women achieve the large pompadour hairstyles. Once secured to the head, the hair could then be swept over the frame. False hair could also be used to fill in gaps or create extra fullness. As well as using false hair and wire frames, women could save their own hair to create “rats” – a matted roll of hair used to create bulk or support the height required in the hairstyles. Hair was also put into material bags to contain it and create the rat. 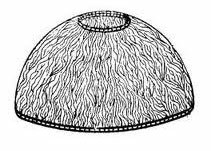 A “hair receiver” was used specifically to store hair from the hair brush or comb – it was a small decorated pot, with a hole in the top of the lid and kept on the dressing table. The modern version of rats are the synthetic hair buns or sausages you can buy in hair suppliers. From rosettes to the large black taffeta, tulle or velvet bows, ribbons were used in the hair or tied on the end of a teenager’s plait. Black velvet was a popular material for ribbon. Female baldness was not uncommon in Edwardian times, caused by overheated tongs, perming and hair products, like hair dyes. Products were not subject to safety testing and ingredients were not required on labels. Products could contain all sorts of toxic or harsh chemicals, including radium which gave things a glow-in-the-dark effect. Half, three-quarter and full wigs were used by women to not only enhance their natural hair, but to conceal baldness. It may have been a brief period in the scheme of things, but the large adorned hats, pompadour hairstyles and corseted figures of the women make the Edwardian era a distinct and memorable one for fashion. As Britain moved into the 1910s and the reign of George V, the continued rise of the Suffragettes and the onset of World War I saw women taking a new direction. Things were about to change. Corson, R. 2000. Fashions in Hair: The First Five Thousand Years. Peter Owen. 720pp. Sherrow V. 2001.For Appearances’ Sake: The Historical Encyclopedia of Good Looks, Beauty and Grooming.Greenwood. 288pp. Oh my, this surely seems to require a maid or a sister or mother. Thank you for the essay. Super helpful article! I’m an actress in a production of the Music Man, and these sorts of styles are needed to maintain the authenticity of the era. I’ve been playing around with a pompadour- I’m wearing a huge derby hat- but my hair is so thin it’s basically hopeless. Do you guys know of any place I could buy a pompadour hair frame? Obviously not a common tool anymore but I think it would do the trick. Thanks so much! Hi I’m writing a report for my Pastiche and padding class just wondering do you know what they used to pad out there hair in the 19th and 20th century? Trying to date a photo of two young ladies, friends. One would have been 25 if the photo was shot in 1908. The other looks about the same age. Both gals wear high necked white (?) blouses with sleeves very slightly puffed at the shoulder seams and have watch bobs pinned on their left lapels. Both also appear to be wearing glasses. The girls have large ringlet shaped curls on both sides of the head, ending at the bottom of the ear. On the top their hair is thick, either pulled to the side or rolled back, but the appearance is flat, not sticking up as high as pompadours. They each wear a large white (?) flower in their hair. Can you help me date this picture? Hi Marianne, A look at the photo of the photo 🙂 may help us try and help you date the picture (can always pop it on our Facebook page or email). For photo comparisons, have a look at PhotoDetective – a great website with lots of Edwardian photos and a bit about what styles were seen in photos and when. Maybe there’s a similar blouse/dress style on there? Ringlets throw us a little, as nowhere near as common as during Victorian era, but occasionally still seen. Ladies wore watch fobs on their blouses (left side) until wrist watches started to be seen around the end of WWI. after the war would they have their hair down? Hi Charlotte, Not in public/for any social occasion – women wore their long hair up, it simply wasn’t the done thing to wear one’s hair down. For work, women also wore their hair up (from the manual jobs kept after the war, to nursing, maids/servants, the WRAF and so on). Hair only started to be worn down, as such, when the short-cut bobs came in during the 1910s. Hi Natalie, Thank you – and yes, indeed, “posh ladies” would have had their “lady’s maid” do their hair for them – plus upper-class women may have changed their outfits several times a day for social reasons (receive a visitor, attend an event, pay a call etc.) and the hair may have been changed too = not easy styles to do without a lady’s maid! Hope this helps.